This is the first in-depth biography of Townsend, an ornithologist from Philadelphia who crossed the Rocky Mountains to the Columbia River in 1834 and made two visits to the Hawaiian Islands. 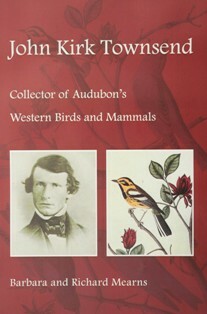 He returned home with a great haul of bird and mammal specimens used by J.J. Audubon in his Birds of America and Viviparous Quadrupeds. Barbara and Richard Mearns examine Townsend’s Quaker upbringing, track him on his journey westwards, provide a modern zoological commentary on his discoveries, trace his troubled career and discuss his association with Audubon and the major contribution that Townsend made to his famous works. The book is essential reading for those with an interest in early Western travels and the Oregon Trail, the wildlife of the Rocky Mountains and Pacific Northwest, or the history of birding. © Barbara and Richard Mearns. All rights reserved.